Meet Jean Paul Cauvin, a French fashion veteran and self-proclaimed non-geek who nonetheless saw the need to follow fashion’s technological future. Jean Paul Cauvin calls himself the binôme, or right-hand man, of the French designer Julien Fournié. Following his advice, Fournié recently teamed up with Dassault Systèmes, whose 3-D simulations last year demonstrated how you could tug an iceberg across the ocean. Why this unlikely partnership? Together, the team developed FashionLab, which enables fashion designers to envision their garments in 3-D from the earliest stages of the creative process. As New York Fashion Week drew to a close, Fast Company spoke with Cauvin about the need for designers to embrace the brave new world of technology-assisted fashion design. FAST COMPANY: What is FashionLab? The technology essentially allows designers to draw in 3-D. What does that mean? There’s a digital table, where you draw with a digital pen. You have a computer screen attached, and you can see the drawing, like with pen and paper. Then you can make this drawing turn. Imagine drawing a 2-D coat. You usually draw it from the front, but you don’t know how it looks from the profile or in back. If you can draw in 3-D and move the drawing, it gives another feel to the whole design. It’s a tool that’s accelerating communication, that’s making very clear what the designer has in mind. 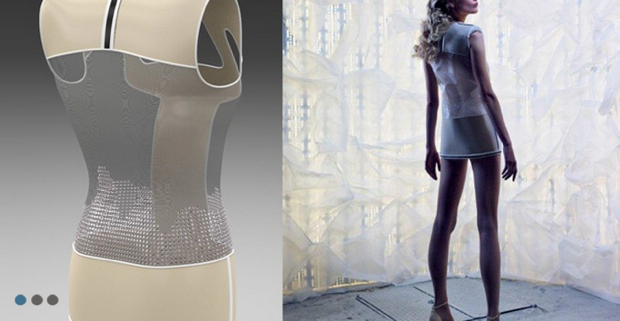 What took so long for 3-D tech to come to fashion? This kind of software has already been used in other industries with much success, for example in the conception and design of cars and of planes. But fashion is a more specific field that’s more difficult to tackle. First, the fact that fabrics are soft, not hard, mean they behave in a very different manner with respect to solid plastic or solid metal that other industries use. We’re creating together with FashionLab a database for fabrics, so you could see how fabrics look and react in the virtual world. This is important because I believe it makes you gain time, and time is money, of course. I spoke with someone this week who feels fashion moves too fast, sometimes to the detriment of craftsmanship. I see the point of this person, but I’ve learned in the process we’ve explored that this was not going to bring craftsmanship down, but the exact opposite of this: iIt will enable us to maximize the time we devote to craftsmanship by hand. The seamstress still does the molding on the mannequin–that step is not erased–but before we start this, we have studied more aspects of it in virtual 3-D. So you don’t think fashion is moving too fast? I think it’s not too fast, only at the moment it’s repeating itself. I think fashion should move forward. I believe much innovation is coming from engineers, and we can see this already in fabric development. The problem is that the engineers and designers are not talking. When a technology company approached you about collaborating on fashion software, were you skeptical? We’re not geeks, but we belong to this era which is digital, so we were curious. I know some older fashion designers who are against any digital perspective. Julien is only 36, and he has a desire to create something new, to create something for the 21st century. Maybe new technology will help create this. We were curious and at the same time a bit skeptical, but were very much reassured by their approach. We think the world of fashion has to go through virtual, 3-D technology, so let’s try and build the tools together, instead of just trying to adapt to them in a more passive way.